Kennedy came to Sydney, and enrolled at the Eora Centre, after an itinerant life as a seasonal worker. 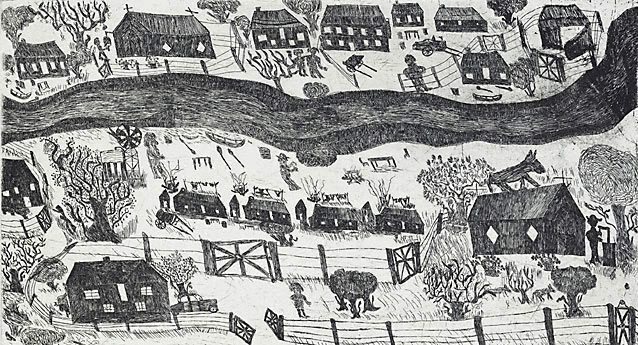 'Days of harmony on my Mission in days gone by' is from his second group of etchings and demonstrates his facility with the technique. As a body of work they are strikingly detailed in their depiction of his first hand observations and experiences of a chapter of Australia's history that is finding increasing expression in the work of Indigenous artists. Signed l.r., pencil "Roy D Kennedy". Not dated. Raw and compelling: Australian naïve art - the continuing tradition , 'Roy Kennedy', pg. 18, Swan Hill, 2005, 18 (illus. ), 27 (illus.). NOTE: this is not the AGNSW impression.